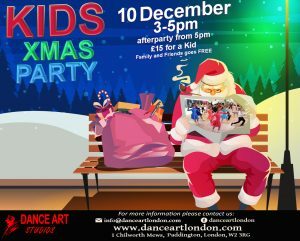 We are now taking bookings for our popular annual Kids’ Xmas party. A fabulous opportunity for all the little ones who have worked so hard on our Kids’ Dance Programme and for their parents to celebrate their achievements and enjoy a seasonal afternoon together. Don’t miss the event, contact us today today to book your place. Children £15 a ticket, parents come free!